You can argue about processors and hard drives until you're blue in the face, but what really matters in a media centre is purely superficial. It's got to look fantastic if you're putting it near your TV, and it's got to make the least noise possible. Foxconn has both bases covered with this diminutive aluminium model, which ambitiously offers quiet (though not fanless) heat pipe processor cooling and a goodlooking perforated case. 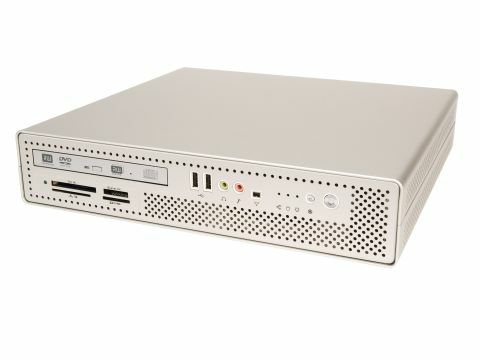 It comes well equipped, with everything bar your CPU, memory and hard drive included in the dinky case. This includes a preinstalled notebook-sized DVD/CD-RW drive and a memory card reader that's quickly becoming a ubiquitous PC accessory. Some of the hardware positioning is a bit difficult to manage, as you'll find when you come to try and force the CPU cooling elements into their tiny allocated space, or when you have to unscrew the bottom of the case to install your SATA hard drive. The 200W PSU also resides outside the case, both for space and heat reasons. The Tuckaway is not really a multipurpose case, because its lack of height means there's room for only one card via a custom riser, and even that's only a bog-standard PCI. This is perfect for a TV card, but this means you can forget about upgrading to a modern 3D card, and while the onboard Intel 915 is fine for video playback and general desktop use, it's easily taxed by gaming. With the amount of heat this box generates, you probably wouldn't want to add the extra warmth of a video card, anyway. Up against the Shuttle XPS (pretty much the leader in the mini-PC field) the Tuckaway doesn't fare too badly. Admittedly, the Tuckaway goes in lacking a number of the more frivolous features of the Shuttle, like its LCD screens and such. It even misses some otherwise crucial things such as an AGP slot, but it comes out fighting thanks to its flatter form factor, which has slightly more living room potential than its more boxy competitors. As long as you're happy with a PC that you're really going to struggle to upgrade, you can be confident in your purchase. At the price this is an impressive combination of kit, and it looks the business, too.